Complete with the short, but insanely expensive, options list that you expect from a boutique supercar company. When Ferrari or Lamborghini rolls out a new model, prices will generally have been set long before in all the various currencies used in all of the markets where the car will be sold. But this process can take a bit longer when it comes to boutique manufacturers, and it isn’t unusual for it to take a couple of years. We have, for example, only recently gotten US pricing for the Pagani Huayra. So the fact that Koenigsegg has only just released pricing for the Agera isn’t really so odd. 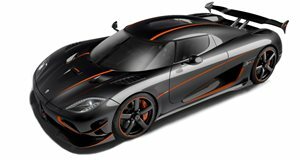 The base price for the “standard” Agera comes in at $1,330,000, the Agera S starts at $1,460,000 and the range-topping Agera R starts at $1,520,000. The options list is really quite short, but none the less eye-popping for it. Matte paint costs $12,000, an F1-style double aero wing is $23,000 and a set of super light “Aircore” carbon-fiber wheels is a whopping $42,500. But the crown jewel is the option of full visible carbon bodywork on the S and R, at a cost of $94,300. Lastly, you’ll have to actually pick it up from Angelholm, Sweden. Such is the cost of owning so rare a car.